Download this solutions brief to learn more about the benefits of IBM MQ and how it can helps you seamlessly connect virtually all your applications, systems, services and files. Messaging can connect your applications and exchange data reliably while keeping applications simple and focused on business logic, so you can respond faster to rapidly changing business priorities and capitalize on new market opportunities. 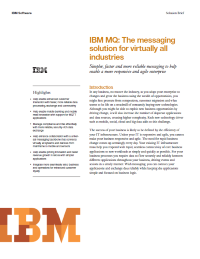 The IBM MQ solution provides a messaging platform to help you seamlessly connect virtually all your applications, systems, services and files. Virtually an industry standard, IBM MQ provides: security-rich, robust messaging; higher responsiveness; flexible support for new approaches and users; help extending to business to mobile and the Internet of Things; reduced complexity and costs.